A note before heading into the issue: I have a habit of not looking at the cartoonists listed on the Table of Contents — I look at everything else on the TOC, but want to be completely surprised by the cartoons as I page through. I see on the TOC that Bruce McCall has a Shouts & Murmurs piece — things are already interesting. On my way to “The Talk of The Town” I stopped to examine the illustration on page 8 by Henning Wagenbreth. Glad I stopped — enjoyable illustration, and, bonus: the name Henning Wagenbreth is now a new favorite name. Moving on: a quick look at the Talk masthead — it’s still the revamped version brought in a few months back. I ask the power(s) that be to reconsider and bring back Coke Classic (i.e., Rea Irvin’s masterpiece masthead — shown directly below — that led off Talk from January 30, 1926 through May 15, 2017). are by the late great Otto Soglow (fondly remembered by many for his creation, “The Little King”). Mr. Soglow supplied the Talk spot drawings in earlier times (pre-Lee Lorenz years as Art Editor). We are lucky his work is still appearing here some forty-two years after his death. And now, finally to the cartoons: the first is by Sara Lautman, whose first New Yorker drawing appeared in March of last year. If the search function on the digital edition is correct, this is her 6th New Yorker appearance. A few pages later is a David Sipress drawing. Mr. Sipress’s active line is immediately recognizable, as is the New York City subway setting (the subway has been in the news quite a lot, with the Mayor of NYC taking a well -publicized ride just yesterday). Next is a drawing by Paul Karasik (whose new book, How to Read Nancy was mentioned here last time, so I’m mentioning it again). In Mr. Karasik’s drawing, Grant Wood’s American Gothic farmer returns to the New Yorker. During Charles Addams’ long run at The New Yorker he had a lot of fun with Mr. Wood’s pitchfork-wielding farmer, as well as at least one of the other folks at the bar in Mr. Karasik’s drawing. 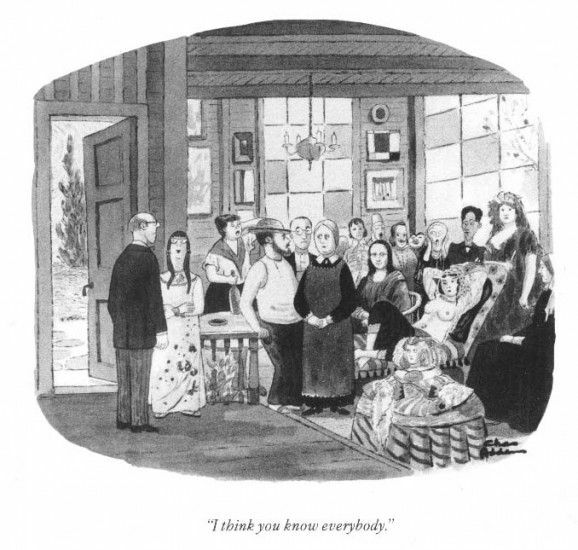 Here’s Addams working with the American Gothic duo– this from The Charles Addams’ Mother Goose. And here’s a link to another. But I, uh, digress…so back to the issue at hand. Opposite Mr. Karasik’s barflies is a timely drawing by Liza Donnelly featuring colluding ice cubes. As with Roz Chast’s drawing from the last issue, I like the way this drawing has been placed on the page. Today’s New York Times carries the headline “‘I Did Not Collude,’ Kushner Plans to Tell Senate Investigators” — hmmm. Several pages later we come to another well-placed/sized drawing — this one’s by Harry Bliss. As noted on yesterday’s Spill, it’s “Shark Week” on The Discovery Channel. It’s also summertime. Mr. Bliss manages to celebrate both, as well as tipping his hat to lifeguards (a New Yorker colleague, John O’Brien, was a longtime lifeguard in Wildwood, New Jersey. I believe he’s the only New Yorker artist with those intersecting credentials). Next is a kangaroo cartoon (also well placed & sized) by Liana Finck (who was mentioned on the Spill yesterday for several reasons…both good). Here we have a drawing that, stylistically (and maybe even thematically) brings to mind a cross between Ed Arno and Arnie Levin, with even a dash of Bill Woodman tossed in to the mix. In the end, of course, it’s pure Finck. A Seth Fleishman Newton’s Cradle cocktail drawing follows Ms. Finck’s. Mr. Fleishman, like the aforementioned Ms. Lautman, started at The New Yorker in the early months of last year — his generous use of black against white made (and make) his work easy to pick out in the crowd. A Roz Chast six-parter follows (Ms. Chast’s first New Yorker appearance was in 1978). I failed to mention last week that Ms. Chast has a new book coming out this Fall: Going Into Town: A Love Letter To New York. A Paul Noth prison drawing is next (Mr. Noth’s first New Yorker appearance was in 2004) — Mr. Noth has a book coming out as well — it’s not due until next year, but I’ll mention it here anyway. 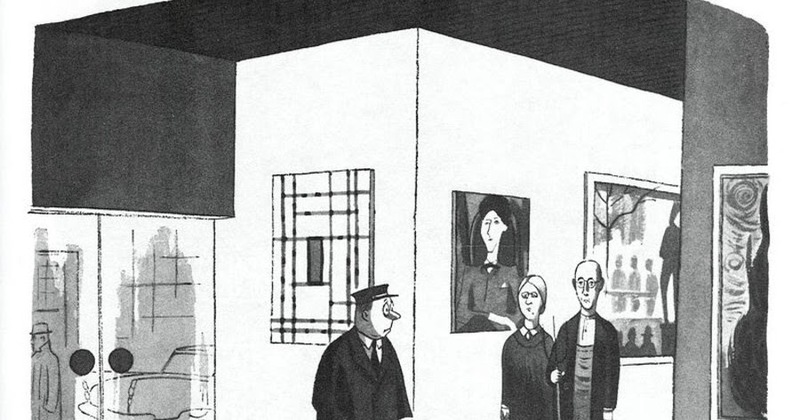 Someone should do a collection of New Yorker prison cartoons. Three pages following Mr. Noth’s drawing is the very recognizable work of Drew Dernavich. If you want to know a little more about how he works, visit Jane Mattimoe’s Case For Pencils post here. Three more pages brings you to one of the newest kids on the block (first New Yorker appearance: November 14, 2016): Lars Kenseth. In this drawing, Mr. Kenseth meets King Arthur, sort of. For some reason I wanted the caption to have the word “sticky” in it, but “licked” comes close enough. Two pages on we find a drawing by cat and elephant-lover, Danny Shanahan, who’s been contributing to The New Yorker for 30 years. No one draws elephants like Mr. Shanahan (he’s even had a New Yorker elephant cover). Another new kid, Ellis Rosen is up next (first New Yorker appearance: December 12, 2016). I like birds-in-flight cartoons. Carl Rose, Lee Lorenz, and a number of other colleagues have offered them up to us over the years. On the opposite page from Mr. Ellis’s drawing is a drawing executed in the instantly recognizable style of William Haefeli (first New Yorker appearance: 1998). The Spill’s archive is lucky enough to have one of Mr. Haefeli’s original New Yorker drawings. Visitors who are shown the piece are usually surprised by its size (it’s quite small) and its complexity (his originals look even more complex in person than on the printed page or screen). A few pages later, we have what looks like a Smith Bros. cough drop board meeting — a bunch of bearded men courtesy of Carolita Johnson (first New Yorker appearance: 2003), followed by a cat and dog living room situation by Christopher Weyant (first New Yorker appearance: 1998; Mr. Weyant is the illustrator of a recent childrens book, I Am (Not) Scared by Anna Kang). I love the way Mr. Weyant draws cats (he joins the Well-drawn Cat Club; I won’t list all the members for fear of possibly leaving someone out). Tom Toro’s next (first New Yorker appearance: 2010) with a rarity: a lethal-signage cartoon. Kudos to the author of Tiny Hands. Mr. Toro’s drawing is followed by a Liam Walsh cartoon featuring a smallish fish with a big appetite (Mr. Walsh’s first New Yorker appearance: 2011). I already mentioned Bill Woodman above, but I’ll mention him again. I see fishing cartoons and I think Woodman. For some examples check out his book, Fish and Moose News (published in 1980). Lastly, the newest of the newbies, Maggie Larson, whose first New Yorker drawing appeared in last week’s issue. I can’t recall how many massage-related cartoons have been in The New Yorker. At least one, now (someone with a better database than mine please let me know of others).